Cue Card became only the fourth British-trained winner of the Weatherbys Champion Bumper when belying his 40/1 odds to come home the comfortable eight-length winner for father/son combination of trainer Colin and jockey Joe Tizzard. 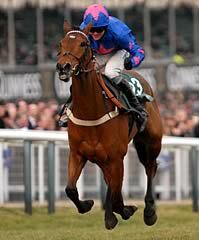 Unlike the previous three British-trained winners, Cue Card was also bred in Britain by Roland Crellin. The winner travelled supremely well throughout and had the race wrapped up from the home bend, when he overhauled the leader Al Ferof. Colin Tizzard said: “If anybody saw his win first time out at Fontwell, they would have seen that he absolutely bolted up and Joe had to go up and down the hill before he could pull him up. “He looked like a four-year-old in the pre-parade ring - I thought that he was a bit smaller than the rest - but I always get negative before a race. He has always done everything so easily at home and he is such an easy horse to train. I said to the owner that we wouldn’t talk about him the past fortnight because nothing has gone wrong since the day we broke him in and it has been easy - I suppose the good ones are. “I said in my local paper that I am sure that this horse would have been third or fourth favourite if he was trained by Willie Mullins. He absolutely sluiced up first time out and he has done the same today. “We kept him busy for three weeks after his Fontwell win (January 25) and then just kept him fresh for today. We were going to give him another run, but then thought why should we run the risk and came straight to Cheltenham instead. “He wore a grackle noseband today and I thought at one point that he was doing too much, but he got there easily in the end. Joe Tizzard added: "We absolutely love the horse, but all the stats say four-year-olds can't do it. But he won well at Fontwell and the second came out and won and the fourth came out and won. “He travelled particularly well and I was able to follow AP through round the top bend and down the hill. I could see he was starting to struggle so then I followed Ruby - the plan was not to hit the front as soon as I did but he still had plenty left. He is a lovely horse and he proved what we have always thought about him. That was only his second time at a racecourse and he is very exciting. Cue Card, trained by Colin Tizzard, won the Weatherbys Champion Bumper, but the second and third pleased trainers Paul Nicholls and John Kiely.